William A. Clemens Jr., Professor of Integrative Biology and Curator of the Museum of Paleontology since 1967, officially retired in December 2002. Bill grew up in Berkeley, got his bachelors (1954) and doctoral (1960) degrees here, and apart from a stint teaching at the University of Kansas from 1961 to 1967, has spent his entire academic career at Berkeley. the tantalizing evidence of molars and jaws that mostly comprise the earliest history of our forebears. 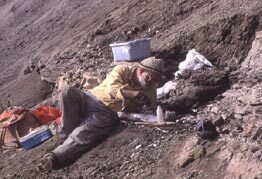 Bill is perhaps best known (or notorious) for his research on the Cretaceous-Tertiary boundary, and his involvement in the question of the extinction of the dinosaurs. As everyone knows, the dinosaurs have simply been a lugubrious convenience of research for Bill. They are the glamorous animals that get all the attention, while the real scientists go to work on the tiny mammals (aka important animals) that were underfoot in those days. When the asteroid debate literally exploded at Berkeley at the end of the 1970s, it was the work of Bill and his students that showed that terrestrial animals did not become extinct all at once. Rather, according to their evidence from the Western Interior, the dinosaurs disappeared gradually, and the rest of the fauna didnt seem to have been greatly affected at all. However, the asteroid proponents, led by Walter Alvarez and his team, were disturbed by this news, and Bill and his colleagues in Paleontology kept up a spirited, but generally good-natured, debate with their counterparts in Geology through the 1980s and early 1990s. Recently Walter was awarded the prestigious Penrose Award by the GSA, and Bill simultaneously was given the J.T. Gregory Award and an Honorary Membership by the SVP. The only way to celebrate these accomplishments jointly (without leaning toward one hypothesis or the other) was with a whimsical cake depicting the extinction of the dinosaurs by an overactive, Technicolor volcano (see next page).